Gwendolyn Mounger and Kathleen Waugus visit the Museum on August 9, 2013. Photo by the author. 30 Encounters with 30 Americans is a ten week blog series showcasing the perspectives of thirty visitors to the Milwaukee Art Museum’s 30 Americans exhibition (June 14 – September 8, 2013). Read about the experiences of these visitors–from couples to families, from students to scholars–and see how their thoughts compare to your own. What are visitors saying about this dynamic exhibition of paintings, sculptures, installations, photographs, video, and more made by African American artists since 1970? This week’s 30 Encounters with 30 Americans marks the halfway point in the blog series and features, as usual, engaging perspectives on the exhibition. 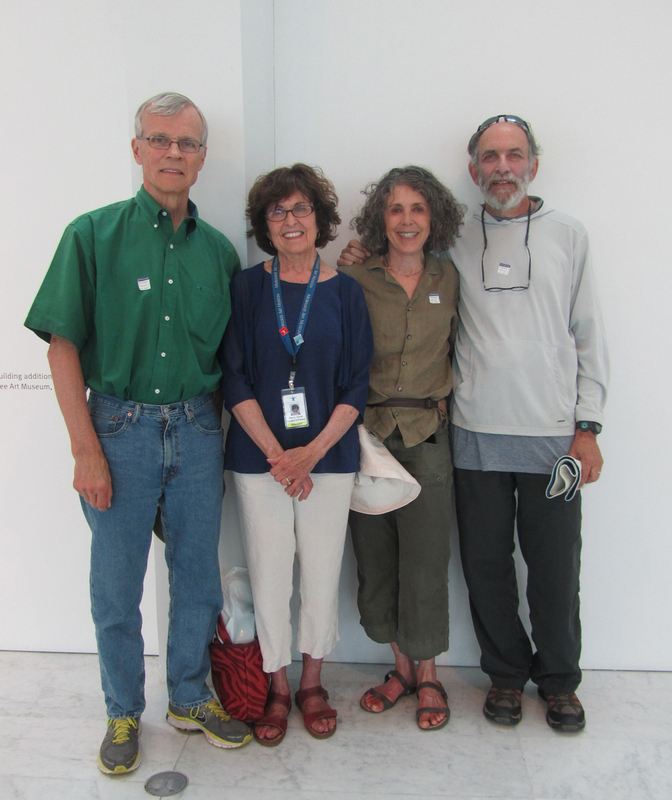 Fran and Mary Wasielewski, Sally Holland, and Jerome Schofferman visit the Museum on Friday August 9, 2013. Photo by the author. #1 What did you think of the exhibition? Fran: One of things that drove home for me was how people’s life experience influences what they produce. I was very impressed with the technical proficiency that was displayed in some of the artwork. Particularly the artist who was putting black models into historical scenes [Kehinde Wiley]. I was very impressed with his work. There were some very provocative pieces in there… I think experience and history influences what an artist [such as Wiley] does. Mary: I wished that this exhibit was going to be here in the fall because I would love to take children through it… I think it is a great exhibit. I loved the variety. I liked the fact that it is contemporary. It is great seeing… Kara Walker, and also more of Kehinde Wiley. The Milwaukee Art Museum has one his works and it is nice seeing more. Sally: This is my second visit here…. I returned to see [30 Americans] again… When I went back to tell my husband, Jerome, about the exhibit, [I talked most about] Hank Willis Thomas. Thomas’ take on advertising and the media, and the exploitation. It never occurred to me what he put into writing, and pictures. It was really profound. Jerome: I thought the exhibition was very informative. The artwork itself was both technically proficient, but also many, if not most, conveyed a message in a very concise, and unmistakable way. #2 What would you say to people who are considering coming to see the exhibition/artwork? Fran: I would say do not miss it. It’s definitely worth more than the price of admission… especially on the free days. Mary: I would agree that. Everybody should come and see the exhibition. I think it is great that the Milwaukee Art Museum has the Target Free First Thursday and are open on the weekend. I would also recommend to the people coming not to miss the Wisconsin 30 exhibit and gallery. Sally: It was provocative, and I liked the interactive aspects to [Duck, Duck, Noose by Gary Simmons]… I loved reading the post-it comments. That was really a great idea. Jerome: I think that it is worth seeing for the diversity of the art. Even though the emphasis is on African American artists…. on the other side of the coin, it shows the same [attempt at] expressing one’s self in art; whether you’re white, black, Hispanic, or any other background. We all come to some of the same conclusions through not only our own personal experience, but the experience of generations before us. #3 Please choose a particular artist or artwork that stands out in your mind. Comments or thoughts? Fran: I was walking into the room with a rope hanging from the wall and… hoods in a circle around the rope… It’s a jaw dropping experience. I mean… think what that symbolizes. That [artwork] had a real shock affect. [Duck, Duck, Noose represents] a sad part of history. A tragic part of our history. Mary: I’m reading a book called The Warmth of Other Suns. It goes so well with this exhibition. It is written by a black woman about the great migration of the blacks from the South to the North. It all… came together when I saw these works of art. Sally: I like Glenn Ligon too. I loved his work, Untitled (I Sell the Shadow to Support the Substance). Just so profound, I had never heard that statement [by Sojourner Truth] before… It is simple and takes you to different places. The paintings, photographs, etc were very layered. I found myself wanting to remember the names so I could look up more of the work and follow them. Jerome: I still do not understand why somebody would want to crawl from the Statue of Liberty… to the Bronx via Broadway. With all respect to the person, I do not quite understand why that is art. But that said, it was provocative in the sense it did remind me of a dream I had many years ago. So for that reason alone, it was worth watching. The opposite of your question, that’s one I think that I might miss. It is hard to single out an artwork or artist, but I thought the technique of the artist [Glenn Ligon], who did the all black painting using charcoal or coal dust was something. I had not seen that particular technique before. 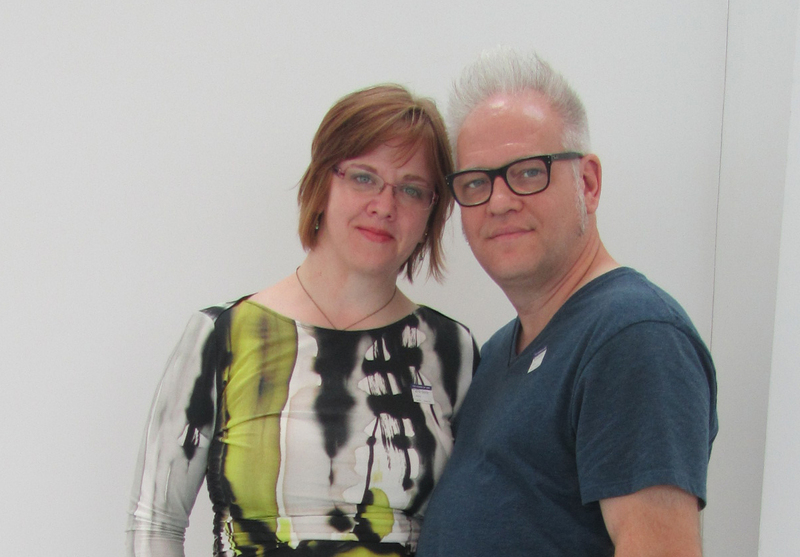 Lisa Blumer and Patrick Recob visit the Museum on August 9, 2013. Photo by the author. Married couple Lisa Blumer and Patrick Recob hail from Kansas City. Lisa works as a graphic artist. Patrick is a multi-talented blues musician. Along with writing the songs for his band, Patrick sings and plays the bass guitar. Lisa: It’s worthwhile. To see just the diversity of the media that’s involved: the colors and the tactile expression. It’s got a little bit of everything and everything was intriguing about it. From the colors to the textures, to the arrangements. Patrick: I think the exhibition is pretty much about stepping into the mind’s eye of a different point of view. From what you know and the way that you see things can be clearly, definitely seen by someone else from a different point of view. I guess art’s that way… You can’t help, but feel with some of the things going on in the media today, and in our world today. You can’t help, but think of racism, and how racism has always been. I’m not saying one way, or the other, I’m just saying it just is. It’s always been there. Everybody has been, focusing on the [George] Zimmerman and Trayvon Martin case, but very recently, we have been focused on the Emmett Till incident that happened in 1955. Then, walking into the one room with the Klan hoods and the robes [Duck, Duck, Noose by Gary Simmons], I think that one really did it for me… It’s sympathetic for me as a blues musician. I mean, it’s not that blues is the black culture. I mean, it’s everybody’s, but it’s rooted very deeply in black culture. You know, so it is where it comes from. So, I have a oneness with it. I understand it a lot better than, maybe, someone who is not a musician and just sees it as, “Oh, well that’s kind of sad, and it’s kind of one of those things,” and you see something that resonates pretty closely with me. Lisa: Patrick is making that connection between the modern media and what we saw here. Patrick: I don’t see it as the African American race getting pissed off. It just is. It’s an expression, and I don’t think anyone should go into this exhibition expecting to see it without being coldblooded, or “Whitey keeping me down.” I don’t see that at all. I see it as a two-way street. Lisa: It’s a celebration. There’s a lot of celebrating here. Patrick: It’s also kind of the same idea as the way that the Rastafarians look at their religion, where they are heavily oppressed, but yet they celebrate life and they’re happy. That’s the whole philosophy. It’s like a phoenix, you have got to rise up out of the ashes, and just kind of celebrate what you have. Lisa: The artworks that really stuck out in my mind was the photograph of the athlete that is branded in chains [Get off on the Right Foot 1988/2007 by Hank Willis Thomas]. Yes, that said a lot to me. That one really spoke to me. Also, the woodcut [Untitled by Kerry James Marshall] the immense size of that and the artistry that went into it. I love the medium that the artist chose and that is not something that is easy to work with. Patrick: …It’s what had come before, but the thing about the carpet is just to think that someone would live in a home with a carpet as dirty as that and, to some, that’s a good living. It makes you happy to be as fortunate as you are in whatever [socioeconomic] level you are at. 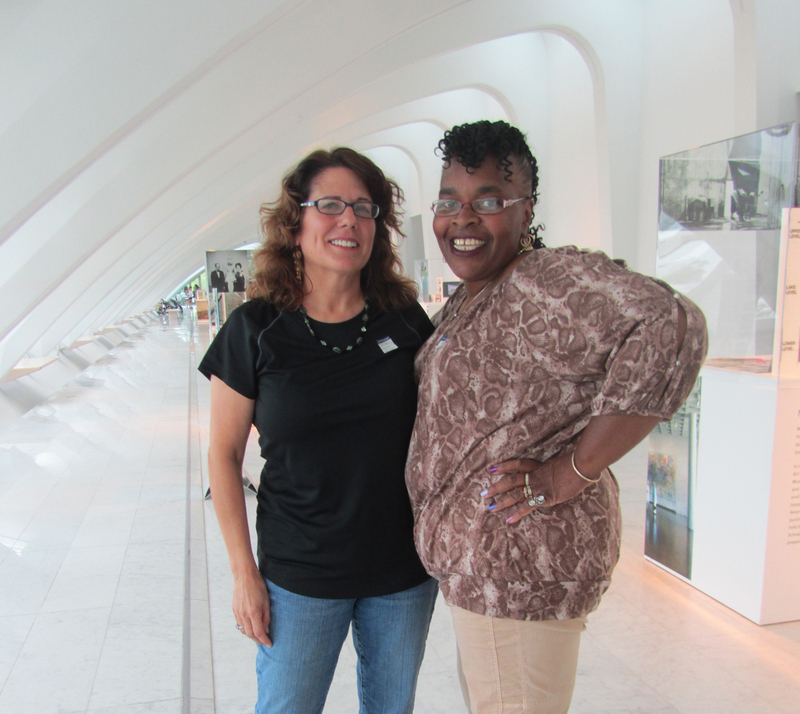 Kathleen Waugus and Gwendolyn Mounger visit the Museum on August 9, 2013. Photo by the author. Definitely the most exuberant pair to be featured in 30 Encounters with 30 Americans thus far, Kathleen Waugus and Gwendolyn Mounger are as compelling as their personalities. Kathleen, originally from northern Wisconsin, currently lives in Milwaukee. She splits her time between being a nurse and a multimedia artist. Often working with acrylic paint on found objects such as wood, clay and glass, Kathleen employs her artistic spirit in the service of others. She assists children through her involvement in Artists Working in Education (AWE), which works to “provide youth in the Milwaukee area with arts enrichment programs to enhance human potential, advance learning and cultivate community.” Accompanying her, Gwendolyn visits the Milwaukee Art Museum from Union Town, Alabama. A self-described, “Bama Girl,” Gwendolyn loves shopping for shoes and clothing, and attending church. Foremost, she is a devoted mother to her 22-year-old son. Gwendolyn: I thought it was awesome. It was really a great experience. I am glad Kathleen mentioned it. Well, I saw it in the paper and I was like, “Oh, I should go to this!” She said, “Really? I didn’t know if you wanted to come.” But it was great and I think that more people of color should come and see this because it is awesome. I mean, really, really awesome. It was, like, really emotional. A couple exhibits I came in and, you know, went in, it was like, “Oh.” It touched home. Kathleen: Go. Don’t be intimidated by art museums. People are just intimidated. Art intimidates… people that don’t know. “I don’t know, I haven’t been exposed to it.” People make a lot of really strange comments about what it is and only certain people can appreciate art. [Someone] said, “An artist is only someone that draws”… You hear it all the time that if you are not drawing something exactly how it looks, you’re not good. So please go see another side to art. Gwendolyn: Go, yes. Please go… They even have free days. Kathleen: …There really is no excuse. Kathleen: We wrote down the [some artists… because we wanted to look them up: Hank Willis Thomas, Jeff Sonhouse, and Nick Cave. Oh, and I was telling Gwendolyn about [Jean-Michel Basquiat. I saw a documentary on PBS about [Basquiat] and I was mesmerized watching the documentary. So, I said, “Let’s try to find that. We have to try to find some more of his work.” His whole story was just so interesting. I remember that he did a lot more work than I thought – not so much installation, but work in the streets [graffiti]. He died so young and it was just such a tragedy… He is not around to see where his work has evolved to. I was going to try to find some information on him, especially for Gwendolyn’s son. In case she wants to get him to see more art. Gwendolyn: I like all of it really. There was one artist that stood out in my mind… [Hank Willis Thomas.] [He] did the Priceless one. Could you please elaborate? What did you think of Priceless? Kathleen: Made me nauseous… It really punched you. I wish it was on billboards all over town. Check back next week for 30 Encounters with 30 Americans: Conversations XVI – XVIII. 30 Americans is at the Milwaukee Art Museum from June 14 through September 8, 2013. For more information about the exhibition, please click here. Sarah Rabinowe is a summer Curatorial Intern at the Museum. Sarah is a recent graduate of the University of Michigan, and this autumn she will be moving to England to complete her Masters degree in History of Art and Visual Culture at the University of Oxford. This entry was posted in Art, Curatorial, Exhibitions and tagged 30 Americans, 30 Encounters with 30 Americans, African American Art, American Art, Contemporary Art, Conversations, Exhibition, Milwaukee Art Museum, Weekly. Bookmark the permalink. Would have been very interesting conversation to include the Wisconsin 30 in the discussion!